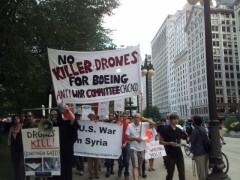 People from across Midwest march on Boeing, say ‘No to drones’ | Fight Back! Chicago, IL - 200 people marched against Boeing Company on Sept 28. Many participants and organizers from that march met for a conference the following day to share skills, experiences and knowledge that will help strengthen the movement against drone warfare. 50 of the protesters came from other states around the Midwest, from groups like the Wisconsin Coalition to Ground the Drones & End the Wars, the Minnesota-based groups Anti-War Committee, Women Against Military Madness and the Brainerd Area Coalition for Peace as well as others from Michigan, Indiana and Missouri. The Anti-War Committee-Chicago (AWC) had called for the march and the groups were joined by the ANSWER Coalition, the Syrian American Forum, U.S. Palestinian Community Network and other Chicago organizations. The Boeing headquarters was the destination for the marchers. Boeing has been targeted by the AWC because they are vying for a Pentagon contract to build a new combat drone. Boeing is the second largest arms manufacturer in the U.S. Combat drones have become controversial in the past two years in part because the Obama administration has sent drones to assassinate American citizens in Yemen. According to Medea Benjamin, founder of the anti-war group Code Pink, the majority of drone victims in Pakistan are not 'high level Al Qaeda' leaders but civilians, including many children. Benjamin, who has organized delegations to Pakistan and Yemen, was the keynote speaker at the conference and protest. Thousands of people watched and dozens took videos as the march, complete with a band, puppets and several banners, went through a park and a shopping district on its way to Boeing headquarters. Upon reaching its destination, the group placed child-sized coffins on Boeing's property. Kait McIntyre, an organizer with Anti-War Committee-Chicago, explained, "The child-sized coffins we placed at Boeing's doorstep represent over 178 children that have been killed as a result of U.S. drone strikes in Pakistan and Yemen and the countless more whose blood will be on Boeing's hands if it wins this military drone contract."